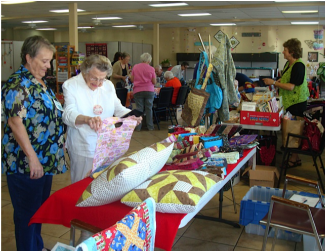 For January we will have Carol Lyles Shaw, a modern quilter from Sarasota who will be teaching us about color, curved piecing, improvisational quilts, negative space and lots of other good things. She will have a trunk show and do a half-day class on Saturday (mini-quilts, $25), and a full-day class (“Parisian Curves”, $45) on Sunday. If you take both classes, the cost will be $60. The classes are filling up fast, so please sign up if you haven’t done so. If you signed up, but did not pay, please bring cash or a check, or you can pay by PayPal. Take both classes and save.